Areca Angkor set in the quietest of Siem Reap tropical garden, is enchanting, peaceful and elegant. The boutique is about stylish relaxation, modern comfort, and the enjoyment a range of activities beyond the discovery of the incredible Temples of Angkor. Areca Angkor offers free transferring services to the Airport and Siem Reap city center. 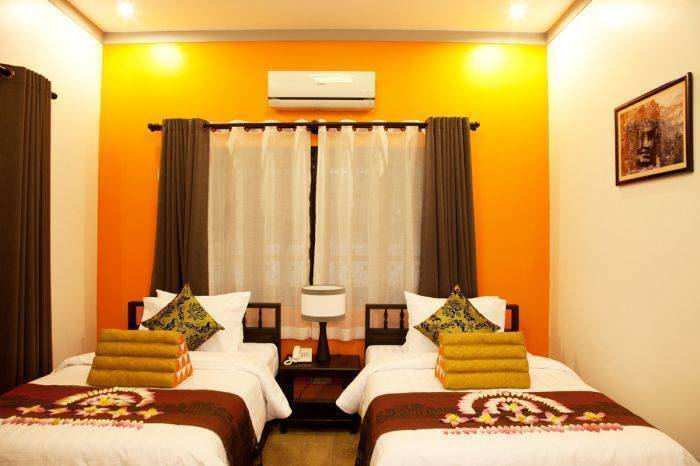 It’s situated just minutes away from Siem Reap French Quarter. a 5 minutes drive or 20 minutes walk from the famous old market (Phsar Chas) and the lively Pub Street, 15 minutes drive away from the World Heritage Site of Angkor Wat Temple and the Airport. Free airport pick up is available. The Areca experience, where fine dining, personalized service and attention to details are a priority, is now to be enjoyed in the beautiful Kingdom of Cambodia. We will ensure that each of our guests - discerning travelers, honeymooners, and families - will enjoy an authentic Cambodian holiday honeymoon in comfort and style. In Areca Angkor Boutique Villa all the rooms have king size beds with pure cotton linens, a tropical garden view, all modern fittings (Air-con, LCD Satellite TVs , DVD player, DVD, Telephone, complementary Wi-Fi, All Day In room coffee and Tea Service and Mini Bar), have a full wall of glass windows opening on a private balcony facing the beautiful garden. Decorated with unique wooden furniture and fabrics from Cambodia, Khmer Art, Cambodian music instrument and fishery equipment, the rooms have a modern mixed design, playing with the contrasts between white and orange color walls and built-in furniture, local furniture and Khmer tile floors, white and dark gray fabrics. 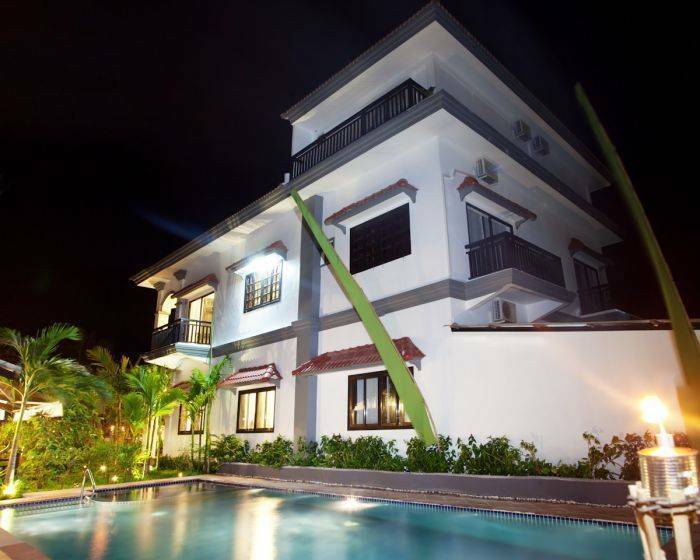 SUPERIOR DOUBLE ROOMS Two rooms accommodated in the second floor facing either with pool or the garden. Every room is fitted with the latest modern conveniences including the latest air conditioning system with climate control, Complementary Wi-Fi, Telephone, a wall mounted 32" flat screen TV, Home Entertainment System (Music & DVD player with Stereo Surround Sound), All Day In room coffee and Tea Service, hair dryers, toiletries and a writing desk and Mini Bar. Bar) Each room has 25sqm of well appointed space, featuring a bathroom with shower, marble bathrooms, Cambodian music instrument and fishery equipment, the rooms have a modern mixed design, playing with the contrasts between white and orange color walls and built-in furniture, local furniture and Khmer tile floors, white and dark gray fabrics and all modern comforts. Superior rooms come with a double bed and connecting rooms are available for families. All rooms are non-smoking! Deluxe Double Room Four rooms accommodated in the ground or first floor facing to pool or the garden. Every room is fitted with the latest modern conveniences including the latest air conditioning system with climate control, Complementary Wi-Fi, Telephone, a wall mounted 32" flat screen TV, Home Entertainment System (Music & DVD player with Stereo Surround Sound), All Day In room coffee and Tea Service, hair dryers, toiletries and a writing desk and Mini Bar. Bar) Each room has 30sqm of well appointed space, featuring a bathroom with shower, marble bathrooms, Cambodian music instrument and fishery equipment, the rooms have a modern mixed design and balcony, playing with the contrasts between white and orange color walls and built-in furniture, local furniture and Khmer tile floors, white and dark gray fabrics and all modern comforts. 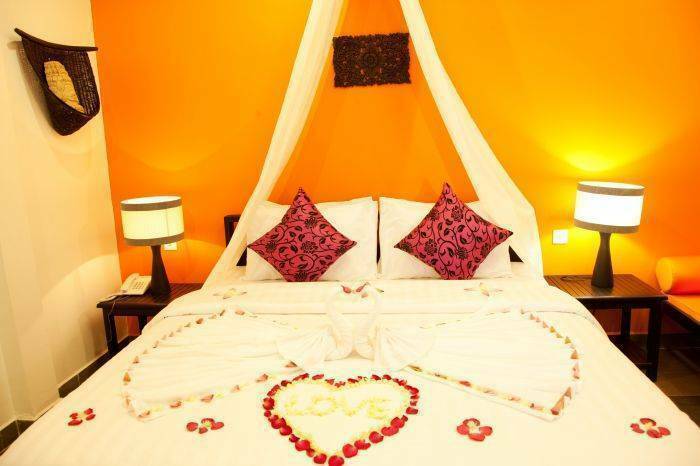 Deluxe Double rooms come with a King Size bed and suitable for honeymooners or special anniversary guest. All rooms are non-smoking! 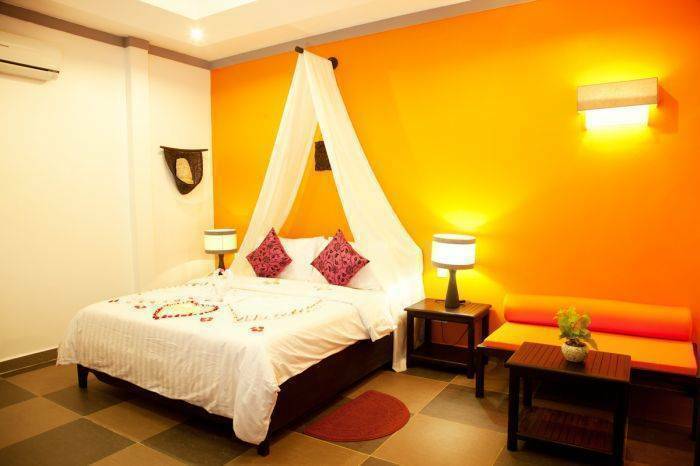 Deluxe Twin Room Two rooms accommodated in the ground floor facing to our tropical garden. Every room is fitted with the latest modern conveniences including the latest air conditioning system with climate control, Complementary Wi-Fi, Telephone, a wall mounted 32" flat screen TV, Home Entertainment System (Music & DVD player with Stereo Surround Sound), All Day In room coffee and Tea Service, hair dryers, toiletries and a writing desk and Mini Bar. Bar) All rooms are non-smoking! Each room has 30sqm of well appointed space, featuring a bathroom with shower, marble bathrooms, Cambodian music instrument and fishery equipment, the rooms have a modern mixed design and balcony, playing with the contrasts between white and orange color walls and built-in furniture, local furniture and Khmer tile floors, white and dark gray fabrics and all modern comforts. 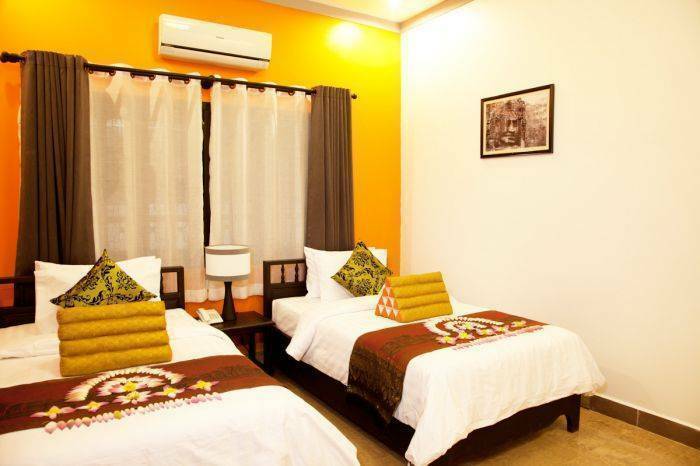 Deluxe Twin rooms come with two single beds and available for families and friends. 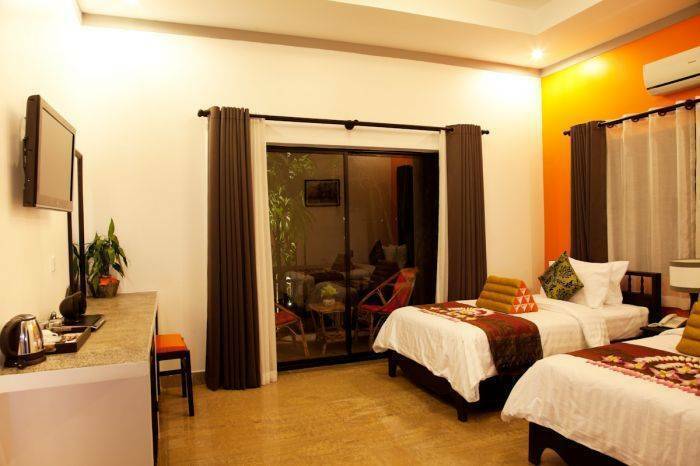 Areca Deluxe Room Three rooms accommodated in the ground floor of pool side. Every room is fitted with the latest modern conveniences including the latest air conditioning system with climate control, Complementary Wi-Fi, Telephone, a wall mounted 32" flat screen TV, Home Entertainment System (Music & DVD player with Stereo Surround Sound), All Day In room coffee and Tea Service, hair dryers, toiletries and a writing desk and Mini Bar. Bar) Each room has 30sqm of well appointed space, featuring a bathroom with shower, marble bathrooms, Cambodian music instrument and fishery equipment, the rooms have a modern mixed design and spacious balcony, playing with the contrasts between white and orange color walls and built-in furniture, local furniture and Khmer tile floors, white and dark gray fabrics and all modern comforts. Areca Deluxe Double rooms come with a King Size bed and suitable for honeymooners, special anniversary guest and all relaxing purpose. All rooms are non-smoking! Low Season: 1 night cancellation fee applies for cancellations within 3 days from arrival date. For no shows , or early departures 100% of the total booking applicable in low and high season. 15 minutes’ drive from Siem Reap International Airport along the National Road 06, turn right to Lok Taneoy road and drive 400m long. Opposite Neap Tep Clinic, down 30m.